You might be a bit tired of hearing about how Instant Pots are so freaking amazing, and how they’re the greatest things since sliced bread. But, most Instant Pots really do live up to the hype, and they actually make preparing meals faster and easier. You can cook meats like ground beef or chicken even if frozen, or you can cook multiple ingredients in the same pot in a fraction of the time it would take using most other cooking methods. The Instant Pot Duo is the most popular multi-functional pressure cooker, but it’s not the only Instant Pot available. Recently, I tested out the Instant Pot Max, which has more cooking functions and features than the Duo and most other IP models. It does cost more, though. Is the Max worth the higher price tag? After 80 hours of testing, here’s what I learned about the product. When I first laid eyes on the 1100-watt Instant Pot Max, I immediately noticed the device’s high quality. It has the stainless steel exterior and inner pot like most other multi-functional pressure cookers, but the display is more elegant than that of your typical cooker. The 6-quart Max is heavy — heavier than the Duo or the Ultra. It feels sturdy, but it doesn’t feel so heavy that you’ll strain your back trying to lift it. The touchscreen display and the dial that sits in the bottom center portion of the display both enhance the aesthetic, while a range of cooking options make the Max seem more high tech. On the top portion of the display screen, there are options where you can specify your system settings. For instance, you can set your altitude (perhaps this is there in case you live atop a mountain). You can also set your temperature preferences (Celsius or Fahrenheit), sound preferences, and change the time on the display clock. Aside from the display, a big factor that differentiates the Max from other Instant Pots is its ability to reach higher pressure levels — 15 psi on max pressure mode. The Max can reach the full temperature spectrum, which allows it to virtually have unlimited functions (fermentation, sous vide, simmer, slow cook, boil, sear, and more). There’s even a NutriBoost feature, which adds movement to foods like rice and soup during cooking. This feature improves taste and texture because it acts as a sort of auto-stirring function. It also has more safety mechanisms in place than the other Instant Pot models (13 safety mechanisms compared to 10 or 11 on the other models). The Max has eight primary button programs surrounding the display: Pressure cook, sauté, rice, sous vide, slow cook, soup broth, canning, and yogurt. But, you can access a variety of options and specifications within these main programs. When I pressure cooked bone-in chicken breast, I could choose between low, high, or max pressure. I could also choose to have the pressure naturally release, quick release, or pulse release. Pulse release lets go of the pressure in quick bursts. However, after trying the pulse release feature a few times, I decided I was going to forgo using it again because it took way too long to fully release the pressure. By the time it finished, I wasn’t really all that hungry anymore (it took 24 minutes to release the pressure when cooking four bone-in chicken breasts). The sous vide function works well, and it maintains an even temperature in the water bath. However, given the size of the inner pot, I could only fit four small steaks in the pot. I also didn’t like the fact that I had to keep the lid closed on the Max, and this means I couldn’t see inside the pot while sous vide cooking since the lid isn’t transparent. The steak still came out excellent, as if I prepared them using a good immersion circulator. I used the canning function to can fresh jalapeño peppers. I just sterilized the jars and lids, filled the sterilized jars with peppers and a bit of water, placed them on the steaming rack, added water to the pot, and pressed “canning.” The process was extremely easy and the peppers came out edible. I was pretty pumped when I saw the accessories that came with the Max. Like many other multifunctional pressure cookers, it comes with a measuring cup, soup spoon and rice paddle, a condensation collector cup, sealing ring, and a detachable power cord. It has a steam rack with handles, which makes it a lot easier to grab the rack from the pot. The Max even includes two silicon, claw-like mitts that you place on your hands so you don’t burn the crap out of yourself when grabbing the steaming rack. Another feature I like about the Max is that the steam release is automatic. You don’t have to set a valve in place. Instead, you press a button on the touch screen to indicate whether you want to quick release, naturally release, or pulse release. This makes it almost impossible to mess up the pressure cooking functions. The Max isn’t perfect. It has some quirks that can be frustrating, and many of the annoying things about the Max relate to its speed. The Max pressure mode is supposed to decrease cooking times. However, it takes an exceptionally long time for the pot to reach max pressure. When compared side-by-side with the 6-quart Instant Pot Duo, the Max took longer to reach full pressure when making most recipes including frozen chicken, frozen ground beef, or frozen spinach dip. For instance, the Duo took 11 minutes to reach high pressure when making two pounds of frozen ground beef, while the max took 20 minutes to reach max pressure and 14 minutes to reach high pressure. As I mentioned earlier, the Pulse release feature is slow as well. The lid on the Max, while durable, doesn’t close as smoothly as it does on other Instant Pot models. It twists into place and there’s an indicator on the display to let you know that you’ve closed it properly, but it feels a bit “sticky” when you close it. It reminds me of an old car door that needs a bit of WD-40. Although this is a small thing, it’s definitely noticeable. Is the Max worth it’s higher price tag? The Max is probably one of the most user-friendly Instant Pots, and it’s certainly a quality device. I think it tries to be too much, but it doesn’t capture the same magic as the Duo. It also feels a bit disjointed. On one hand, the Max feels like it’s for the advanced cook, providing extra controls, more temperature settings, and features like canning. But on the other hand, it feels like it’s for a novice, with features like button-controlled pressure release and indicator icons that walk you through everything. I feel like Instant Pot could have left out some features, like pulse release and even the Sous Vide mode, and instead given the Max Wi-Fi capabilities like the Instant Pot Smart. Or, Instant Pot could have left these features out altogether and given the product a lower price tag. The Max typically sells for around $200, which feels exceptionally high. Overall, the Max is a stellar device, when you compare it to many other multi-functional cookers on the market. 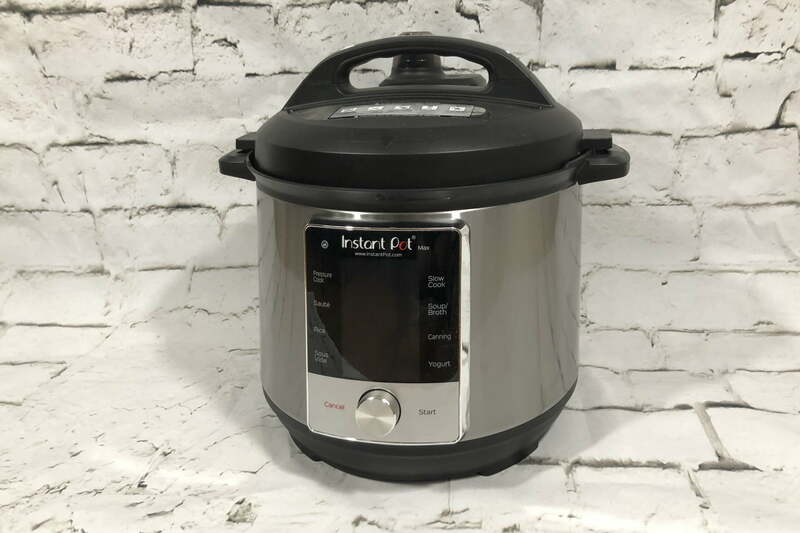 But, Instant Pot set a very high standard with the Duo and with many of its other pots — a standard that says to customers, “we create stellar multi-functional pressure cookers at an affordable price.” The Max, considering what it offers, simply isn’t affordable enough, especially when you can easily find a different model Instant Pot (like the Duo) for under $100. If the Max goes on sale, it’s definitely worth buying. But instead of paying $200 for the Max, you’re better off picking up an Instant Pot Duo (read our full review here), Instant Pot Ultra, or even an Instant Pot Lux (read our review here).